Dr. Leah Krugman discusses Two different classifications of pain that Pets experience and symptoms of each. Dr. Shelley Smith explains what an exotic pet is, Common problems with exotic Pets, why they are different than cats and dogs and when to know an exotic pets health is in danger. Dr. Leah Krugman discusses what to consider when it is time to say goodbye to our Pets and decisions to be made when it is time. 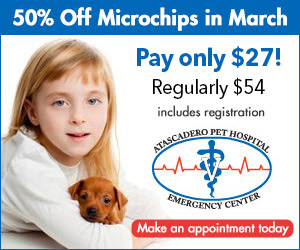 Dr. Jennifer Burke, C.V.A., is Atascadero pet Hospital’s Certified Veterinary Acupuncturist. In the video, Dr. Burke discusses what conditions acupuncture is used for and how Pets react to it. Dr. Ofer Cherbinsky discusses the different methods for locating and removing foxtails using a CT scanner, surgery and The amazing technology of “ultrasound-guided foxtail removal”. Dr. Ofer Cherbinsky discusses the dangers of foxtails and the threats they pose once they have migrated instead of a pet. Dr. Aaron Schechter discuss common problems with our pets as they enter their senior years including dental disease, weight management, arthritis. Dr. Aaron Schechter discusses common issues with young adult dogs including weight management, fleas, ticks, skin issues and trauma.